Norwich WWTP – RBC Replacement - Norwich, N.Y. The scope of work included removal of the existing RBC equipment, which required coordination with plant operational personnel as to maintain plant treatment levels while biological trains where taken off line. The work included replacement of 18 RBC units for 21.5’w x 12’l tanks, making up 3 trains with 6 units in each, the RBC media replacement was with varying densities of media for enhanced treatment. 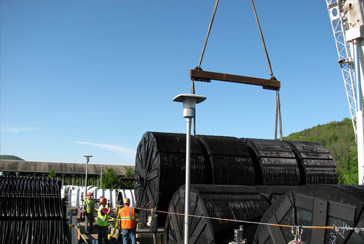 The sequence of construction required each train to be fully operational and biologically treating wastewater prior to allowing the next train to be removed from the treatment process. Work also included the installation of new blowers for mixing aeration in the first two tanks of each process train, including diffusers and piping. Revisions to the biological process required media modifications for final performance requirements.